In a larger sense, Cyd Charisse's character epitomizes the community aspect of the film even more than Fred Astaire's character. Gabrielle is the real outsider of the film, coming from the ballet to add a "touch of class" to Jeffrey's production. Not only does she feel judged and out of place among the Broadway crowd, but she's also under a constant pull from Paul, her boyfriend and manager, to leave the lowbrows and go back to the ballet, where the "real art" is made. She finally has to break with Paul and literally join the room full of kids to really find herself as a performer and a person. In the first bars of the song, Buchanan is trying to convince Fred to join the show by talking about the link between theater and life. Levant and Fabray are listening and focusing on the director to see where he is going with this and join in with their examples. The first stanza plays as a discussion and Fred finally starts contributing as he gets the point and buys in. I like how eye contact in this portion of the song stays within the group, moving from speaker to speaker and to Fred to gauge his reaction to their arguments. There is no audience at this point, just the characters. Everyone is dressed in street clothes, with a nod to their respective characters. Jack Buchanan jacket is relaxed and casual with the contrasting shoulder and the ascot. A working theater outfit. Fred is the successful entertainer and film star, so his suit is impeccable. It is also the darkest outfit - he is just joining this group. Oscar Levant is tweedy and bookish - a writer and Fabray is light - she is the optimist in the group. Yet everyone is in either Gray or Blue to retain the cohesive nature. Fred Astaire is seated almost captive in a chair as they plug the show. The others circle around him as they convince him to sign on. When he starts adding ideas at the end of the first stanza, he is allowed to step with the others. The number turns to the “audience” as the 4 characters perform the scenarios posed in the song and move as one group. The focus is passed to all of the characters - Humor for Levant, the lady in peril for Fabray, Fred and Jack knocking each others hat off. Finally - they join as four for the finale, arm in arm. They are of one mind. 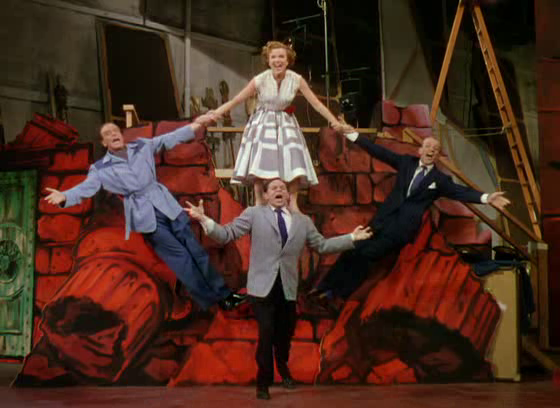 Earlier musicals seemed to be focused on a couple of people at a time, but this number includes four people. Each dance move incorporates everyone and they all support one another in song and dance. Earlier musicals seemed to have at least one standout performer while the others in the scene would play a secondary role. The color palette for this scene is grey and blue. Grey seems to be a derivative of blue, so the color choices are even more interlinked. While they aren’t in the exact same outfit, the color scheme works together in a sort of uniformality. Setting the performers apart by way of costuming would only serve to separate the cohesion between characters. For the most part, the choreography has the group in a single line executing the dance. Even in comedic bits that occur, the characters perform as one in a straight line. What I found interesting is that the female lead in this scenario is staged as equal to her male counterparts. For one thing, this is my favorite musical of all time!!!! It is so different than the typical formula that musicals put out , but alike too. Everyone is trying to convince Tony that he should do this, that he was made for this and he's like "nah, no thanks"....then the pivot and Tony discovers, "yes this is me". It is kind of dark in some ways with some of the tunes played, the bickering of spouses, the way the characters don't see eye to eye on the show itself and the love triangle that most of the players don't even know exists. #2 is harder for me to answer because I view this movie with more love than cutting it up, but I have always noticed that Jeffrey is the only one dressed in a "relaxed" way, and he is the most uptight of all the characters (classical actor/director). The comedy in this scene has always delighted me. It is one of the things I love about the film. I have no idea what it is like to create a production, to take it out in previews, to change it and then turn it into a hit show...to me I thought the process (at least back then) would be like this. You fight, have issues, lose the money, the diva dancer, the previews, failure, revamp, and BAM you kids have a hit show. I LOVE IT!!! My only regret is we lost "Two Faced Woman", I think I would love the film even more with that dance. Thank you for featuring my favorite musical ever. I think the contrast between the elegance and opulence of the musicals in the 1930s vs. the "That's Entertainment" clip stands out. Compare the extravagant settings and costuming of a Busby Berkeley sequence or a dance scene from Top Hat with the "That's Entertainment" clip and you'll see quite a difference. Berkeley's numbers has elaborate sets with waterfalls and staircases. This number is on a stage with a couch, some ladders, and hand-painted scenery. Top Hat has Astaire in coat and tails while this clip has a nice suit. Berkeley's numbers has the female performers wearing all types of extravagant costumes. The lady is the clip is wearing a dress that any woman could wear. The camera work is close in the beginning. Everyone is in one spot on stage and it's very much a "stage" in that there is an unbroken 4th wall. The actors are bunched in one area and the camera work is close. I want to say that there was only one camera at first, but maybe there were two. This is while Astaire is in the chair. The other actors are all performing to him. Later, as they break into the dance, the performance is again "straight on" like a stage. The interaction is that they play off each other. I even heard a laugh during the "one foot up" routine part of the dance. The British actor is in blue, but everyone else is subdued in gray or black. Even Nanette Fabray's dress is gray and white in a pattern. The costumes are subdued. This adds a cohesiveness against the red of the sets. Nanette doesn't handle Levant the same as the other two men (hand holding) who is playing her husband. It's like he isn't as important in that moment - as they are both in it for their team (marriage) while the other two actors are being "sold on" the idea. This number illustrates a group of friends/colleagues none of whom become more of a focus from the other. The fact that they are a foursome highlighted equally, differs somewhat from the musicals previously covered where the focus tended to be soloists or duo Fred and Ginger, Garland and Kelly. Each performer receives the same amount of attention and they are constantly synchronizing their movement to support the other in projecting the purpose of the number to advance the story. As was pointed out in the lecture video by professor Ament and Rystrom it is a good example of how the music and song are integrated into the story. In the musicals of the 30s and 40s for example, the numbers were often secondary to the actual story. They might be practicing or performing the music on stage or rehearsal. This number moved very smoothly from dialogue to music as they try to brainstorm as a team, the show they desire to produce. The costumes also support the fact that they are not performing on stage but an extention of their previous discussion. The men were in suits, Buchanan's being a bit more casual than Astaire and Levant. Nanette Fabrays dress was simple and attractive, effectively in their "street clothes". I feel the staging and choreography reflected the friendship and casual professional relationship of the characters. The only exception might be when Nanette is placed "on" Levants shoulders perhaps emphasizing theirmore personal relationship. These people are cooperating, getting along, having fun and using their talents to create something positive very much in line with the assumptions presented regarding 50s musicals on modeling community and cooperation. Its a great song with wonderful performers, that's entertainment! There are no breakout "star" moments of the song, where one person gets the spotlight, even though only one person may be singing at one particular time. There is a lot of interplay and glances between each member of the group during the song, but it doesn't feel contrived; these are friends who are having a real conversation, not performing to an audience. The group gives us a feeling of camaraderie, mutual respect, and admiration for each other. Once again, no one stands out. They're each dressed in day-to-day apparel as is appropriate for their character. The only one slightly dressed up would be Tony, but it isn't over the top, merely a classic look for a man of his means. This is truly an ensemble performance; even with solo parts in the singing, it wasn't designed to showcase any one performer as being more important to the performance as another. The same can be said for the dancing. Astaire's talents weren't the focus of this number. They all worked as a team. the side-by-side nature of the dance kept them all equally in focus as performers, rather than drawing your eye to one person as the standout performer. I liked watching the first part of the song, where they are taking turns convincing Astaire's character of their ideas. The glances from person to person are just the kind of interplay you'd see in a group of people excited about something and telling someone else about it. It would have worked even without a song. This is an ensemble number. There have been many earlier ensemble numbers, but this one doesn't show a group of people in synchronized singing and dancing. It shows four people doing individual schtick and playing off of each other. Occasionally one or more characters do something by themselves, then become part of the group again, such as the Buchanan/Levant cigarette moment quickly becomes an ensemble of all four. The ensemble reflects values of security, loyalty, fidelity, unity, and stability. The costumes are muted in color, a far cry from some of the garish colors of the 40's. And they are the kinds of clothes that anyone in 1950's suburban American might wear -- a simple sleeveless blouse, casual suit and tie. I imagine that many people in the theatre were wearing something similar or had something similar at home in their closets. The suits are cohesive in their similarity, and also individual in their different colors. At this point in the story, there is no conflict between the characters. Everything is cooperative and there is a strong sense of fun. Here we have actor, director and writers working together to show the joy of the theatre in a light, fluffy song and dance. Interestingly, conflict between the characters begins to arise when the light, fluffy show is replaced by the Faust legend and the conflict inherent in it. And scrapping Faust and returning to the light, fluffy review takes us back to the spirit of fun and geniality between the characters. Is it too much of a stretch to see the European myth as disruptive and the simple all-American song and dance as cohesive? Or elitist high-brow entertainment as a threat to the comfort of an unpretentious song and dance? There is no one person that is shown more than the others. In earlier musicals there was a star that was shown more than anyone else. Now the stars all have the same amount of space in the scene. I noticed that each star has his or her own style of dress. The girl is dressed casual and the men are dressed according to the roles in the musical. I noticed that there are only three that dance in the scene and the other one steps out of the picture and only does a comedy role with the ladder. 1. There is a certain playfulness between the four that I think helps establish the ensemble aspect to it, although they do exclude Levant at one point. Otherwise, it does show an equality that I think has been missing since Astaire and Rogers worked together. 2. Their costumes are all slightly different, though they’re all dressed in a professional manner, so it doesn’t feel as though they’re trying to emphasize anyone over anyone else in terms of the costuming. 3. Levant seems to be the more comedic of the four, especially when he does the bit with the ladder (I’d like to note that both this and Astaire and Buchanan in bowler hats are references to Laurel and Hardy; the ladder gag is based off of a gag from their silent short, The Finishing Touch). Once again, the playfulness between the four seems to be emphasized, giving the idea that they’re all friends and glad to be friends. 1. The most noticeable aspect of how the four characters relate to one another here in The Band Wagon, as opposed to other musicals, is that they all seem to collectively be working towards the same objective in their performance. In music theatre - and in theatre in general - we are often taught that certain songs or scenes are used by a character to get what they want or need from another individual(s) in the story. In earlier movie musicals, that type of interaction is often strictly between the character who is "selling" their objective, and the character who is their intended target. They may on occasion look wistfully off into the distance, but for the most part, the character doing the singing is aiming their attentions solely on their scene partner. In this case, while it initially seems that the characters are trying to "sell" one idea to each other, it soon becomes clear that their actual target is the audience itself. They are all already more than on board with the idea of what show business is and have no need to convince each other. Instead, they are trying to convince us. Their faces, voices, and bodies are all pointed squarely towards the camera, and they seem to be leaping past the proscenium-like confines of the screen, and will not stop until we are just as sold as they are. 2. All four characters, while still expressing some semblance of individuality - Astaire and Levant in their own versions of professional suiting, Buchanan in stereotypical "director" attire, complete with cravat, and Fabray dressed decidedly feminine yet casual enough for backstage - are kept on an equal visual footing by being kept in muted and relatively neutral colours. This helps to further the concept of "be yourself, but not too much, because we're all in this together and anyone who can't get along is scary and probably suspicious" that was popular in 1950s cinema, as studios became more fearful of rocking the boat re: societal norms as Mccarthyism crept its way into the industry. 3. In keeping with the sense of solidarity and "we're all in this together" that defines this number - and much of the genre in general during this time period - any sense of one-upmanship that may have been present in previous eras of the movie musical is more or less done away with. Each character is in on each other's gags, and is willing to help execute the payoff or punchline. The choreography is comparatively simple and uniform, and solo singing parts are equally distributed. There is no "star" of the number because, as mentioned in my first answer, they are all working together to convince the audience to see things their way. Considering the tenor of those McCarthyism times, it was rather ironic that the thrust of the movie is toward 'all pull together for the common cause' and no one is better or different or more important/less important. Very socialistic indeed! 2. The “costumes” were more something the actors would wear normally - not what we would think of asshow wear and the colors flattered each other. No individual wear made them stand out from the ithers. 3. It was great ensemble staging - the actors totally connected. Ugh... After Seven Brides for Seven Brothers....I really do NOT like this film. AT ALL. But I am going to work on getting over myself a bit for the sake of the course... In fact this has me wondering if this is a time period of musicals I generally do not like and am curious if I can identify why through the lens of the course. So thanks for that! It is more like a sentence someone else finishes rather than a dialogue. It builds - like a brain storming session. Stream of Conscientiousness. This is different in that some other scenes we have looked at are more of a discussion of 2 separate ideas - Like "A Lovely day to Get Caught in the Rain" with Astaire and Rogers which feels like a discourse. Or other scenes which used songs to encourage or attempt to change someone's mind on their perspective. Or set the record straight. I challenge this statement- given the men's dress. I don't find cohesiveness at all. These 3 suits are very different - one very fashion forward, one very everyday and one headed towards being more formal. The color palette is off. The blue color block really pops and is attracting/distracting given the red tones of the set. And Nanette is very neutral and having trouble coming forward visually. Very smooth movement of props was truly outstanding (see?? I found something I liked!). Always a hand to help you out - or off- a prop. There is no question that this was a well chosen scene to drive home the point of underlining "everyone's EQUAL cooperation" in a post war world. Loved Oscar's ladder scene. The characters in the Band Wagon work as a unit, rather than as a star with supporting cast. We see that in the way they solicitously pick Astaire up off the floor, and how their hand and finger extensions all echo and support the others in the group. They stay together as a tight unit as they dance, even if individual moves are different. They listen attentively to each other. Their costumes seem to have unity in the semi-formality of dress, yet there are two patterned outfits and two plain-colored, and they are positioned in a balanced way, either together or every-other slot. Astaire is given the classy pinstripe as a subtle distinction. This is different from earlier musicals that featured a star out front with all others playing "second fiddle" roles. There is a friendlier tone to the group, rather than competitive. 1. As you watch the interaction between the four characters in this scene, what do you notice about the way they include each other or relate to one another? How is it different from early musicals we have discussed? The characters play off each other as each performer adds his/her idea about how to plan a production. It’s a creative work session put to music and dance, but in a simple way as opposed to the giant production numbers of the 30s. 2. What do you notice about the costuming of the characters that indicate cohesiveness of the ensemble, as opposed to setting anyone apart? Be specific. There are no flashy costumes here. All of the characters are performing in street clothes. This is in sharp contrast to musicals in the 30s where costuming for the dance numbers are elaborate and exquisite. 3. What do you notice about the staging and interplay between the characters that helps define the relationships between the characters in the song? They are working collaboratively as opposed to individually. This is especially clear when they build the pyramid. No single performer has the spotlight. They support each other as they go through the routine and the song lyrics build on that as well (each performer adds new ideas that build on what the previous performer has added). 1. In the clip, all four share pretty much equally the song, dance, and gags. No one person stands out or has the majority of the scene. Previously, most scenes featured one or two people with everyone else either being in the chorus or sitting on the sidelines. 2. In this scene, everyone's costume is fairly close in color and intensity. The only real pop of color is the red rose on Nanette Fabray's belt. In contrast, in the movie On The Town, the 3 men wear their sailor uniforms (which being white help them stand out) and the 3 women wear red, yellow, and green and not in pastel either. This really makes the women stand out from the background even in busy scenes. Using the colors of a stoplight aren't coincidental either. I'm sure we could draw some parallels to how the colors are used with the women's characters and circumstances. 3. The 4 characters are working together for their collective good. They each need something out of this collaboration. The Fred Astaire character quickly becomes part of the group rather than being the one needing to be convinced - he moves from being the only one seated to singing and dancing with them. Each character sings a line then one of the other picks up the next line. They pretty much have the same amount of screen time. The story usually revolves around just a couple of people in previous musicals. They pull each other into the action, like when "passing" Nanette to each other during a dance. None of the costumes really stood out from the other. The men wore different versions of the same outfit...pants, a shirt, and a tie or cravat. They are not dressed flashy and have basically the same colors in their costumes of blues and grays. The red on Nanette's dress is the most showy item on the costumes. In earlier musicals, there are solos and the stars have flashier outfits, like Fred & Ginger musicals. Even scenes with more than one actor in previous musicals, it is usually just one or two of them that have the spotlight for the scene. Most of the time they are on the same level, same plane or side-by-side. They have the same choreography. The interaction is friendly among them all and not one of them tries to stand out from the rest. 1. I notice the actors all work together as one on the song as opposed to having the song done by one person or with a group of people where one person was doing a majority of the singing. 2. The characters are all wearing regular clothes instead of ornate costumes. This is so the audience keeps its focus on the action within the scene instead of what one or more of the actors is wearing. 3. Each character has a unique personality, but still manage to work together. 1. There are lots of open arm hand gestures - welcoming everyone into the song. They are having fun - playacting a whole scene or idea in one line of the song. Fabray walks by playing the Femme Fatale while Levant does a comedy bit with the ladder behind. They are comfortable with each other, and having fun. It's not a love song/wooing moment as we saw earlier in the scenes both in the 30's & 40's (Rose Marie, Top Hat, For Me and My Gal, Cabin in the Sky). No one is trying to impress another person. The dancing that the 3 do together is lighthearted and fun, they're laughing as they avoid stepping on each other's feet and crossing legs in front of each other. 2. They are all dressed in fairly muted colors - blue, grey, black, white. The only bright color is the small flower on Fabray's dress. The men are dressed in casual styled suits, all similar but also individualized enough for each character. Fabray is casually dressed to look professional (and fit in with the men), but still looks feminine in the long skirt and the flower at the waist. 3. The character of the director starts the song - he is taking the lead, initially, as a director should. He gives the others ideas to work from and with. The characters of the writers sing about plot devices. Initially all 3 are helping the actor (Astaire) find his part, they all watch him to see if he understands. Astaire joins in slowly, only singing one line (almost a minute into the song), then the others take over again before he's given a chance to fully show he understands and can 'play the part' too. It's not a flashy scene. It's very relaxed. They look like they are all having fun and are good friends comfortable with each other. They are mindful of each other so the playful back and forth flows nicely. The color pallet works nicely together and is not flashy but more toned down colors (grays and blues). Oscar and Nanette are both in gray showing a connection. Oscar is shown as being the clown and joking around which identifies his character's personality. Nanette holds her own in the boys club even though Oscar tries to upstage her at the end. Fred as always is very classy.